James “Jim” Francis Lansdale was born December 24, 1939 in Orlando, Florida. He was an avid researcher of World War II aviation history with a focus on the Pacific War. He was the manager of J-Aircraft and served as the site administrator for the J-Aircraft Message Boards and was a founding member of the Pacific Air War historians (PAWH). Some of the topics that he was most passionate about included the 1st Air Commandos, the Polish Air Force, the 13th Fighter Command, the Yamamoto Mission April 18, 1943 and the paint colors used on Japanese aircraft and their markings. Over the decades, he worked with many authors, WWII veterans, and historians including Robert Mikesh, Charles Darby, Jim Long, Ryan Toews, and Henry Sakaida. Lansdale collaborated with aviation artist Roy Grinnell on three fine art paintings including "First Kill" and "Mission Accomplished" and "Big Bang in Burma". 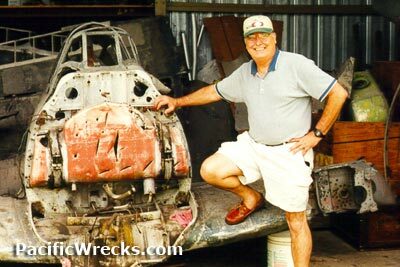 Since the 1990s, Lansdale was a frequent contributor to the Pacific Wrecks website, sharing his reserach and the many photos that he had collected. Lansdale's interests and expertise included Japanese aircraft paint schemes. He located pieces of aircraft aluminum which had been collected by Allied personnel during the war or from aircraft wreckage postwar. These fragments were valuable because they retained undamaged portions of the original primers and paints used to mark, protect and camouflage the airplanes. Lansdale used these to seek answers about the original colors used to paint the famous Mitsubishi / Nakajima A6M Zero. He devoted tremendous effort to researching the history of the 13th Fighter Command of the 13th Air Force, also known as the "Jungle Air Force". He made a detailed study of the April 18, 1943 Yamamoto mission when G4M1 Betty 2656 Tail 323 with Admiral Isoroku Yamamoto was shot down by P-38G Lightnings from the 339th Fighter Squadron. Lansdale collaborated with the "Second Yamamoto Mission" (SYM) research group and veterans of "Operation Peacock" including Rex T. Barber and Doug Canning. Lansdale wrote a detailed history of the mission which was published as a chapter of the book 13th Fighter Command in World War II. It covers every aspect of this mission from both the American and Japanese sides, plus the kill controversy between Rex T. Barber and Thomas G. Lanphier, Jr.. The evidence indicates that Barber was the sole pilot responsible for the shoot down. Jim was also a scholar of the 1st Air Commando Group (10th Air Force) in the China-India-Burma (CBI) theater. He corresponded with veterans including Lt. Col. R. T. Smith and helped organize a reunion. Professionally, Jim was a high school science teacher at Laurelcrest Preparatory School in Bristol, CT (twelve years), Holton-Arms School in Bethesda, MD (2 years) and Pine Crest Preparatory School in Fort Lauderdale, FL (30 years) and resided in Pompano Beach, FL with his wife Carol-Ann (married 56 years). He passed away peacefully on October 24, 2018, after a courageous 22-year battle with Non-Hodgkin’s Lymphoma. His family includes his son Christopher (Marlena), and daughters Kimberlee (John) and Teresa (Paul); grandchildren Alexander, Lorenzo, Zoë, and Ryan; brothers Donald Chris (Lisa) and Robert, and sister Nancy; niece Amanda (T.J.), nephew Michael; and cousin Lorena (Roger). Per Jim's wishes, much of his research material, notes and book collection were donated to Pacific Wrecks and will be accessible to the public as part of the "Jim Lansdale Collection" and will be integrated into ongoing research and portions made digitally accessible. "James “Jim” Francis Lansdale, 78, of Pompano Beach, Florida, born on Christmas Eve in 1939, in Orlando, Florida, to Maria Ligia and Gillman, passed away peacefully on October 24, 2018, after a courageous 22-year battle with Non-Hodgkin’s Lymphoma. He is survived by his wife, Carol-Ann (married 56 years); his son Christopher (Marlena), and daughters Kimberlee (John) and Teresa (Paul); grandchildren Alexander, Lorenzo, Zoë, and Ryan; brothers Donald Chris (Lisa) and Robert, and sister Nancy; niece Amanda (T.J.), nephew Michael; and cousin Lorena (Roger). Jim attended St. James School in Orlando (grades 1-8) and graduated from Winter Park High School in 1958, attended Rollins College in Winter Park, FL, the University of Hartford in Connecticut (B.S.) and Nova University in Davie, FL (M.S.). He was a high school science teacher for 44 years, 12 years at Laurelcrest Preparatory School in Bristol, CT, 2 years at Holton-Arms School in Bethesda, MD, and 30 years at Pine Crest Preparatory School in Fort Lauderdale, FL. He was a devoted husband and father who loved his family and friends, teaching and coaching, and was known for his integrity, loyalty, sense of humor, and pride in his Nicaraguan heritage. An avid nature lover, Civil War buff, and fan of science fiction, Jim also enjoyed gardening and traveling, arrowhead hunting in North Carolina, camping and exploring parks and historic sites with his family. He was also well-known as an expert in World War II aviation history, and assisted many military aviation artists and historians around the world through his meticulous research. He managed a research website, J-Aircraft.com, and in 2016 he participated in a symposium at the Pearl Harbor Arizona Memorial along with other Pacific Air War Historians. Jim was a true original whose vibrant spirit and kind heart will be greatly missed. A memorial service will be held on Saturday, November 17th, at 10:00 a.m., at St. John the Baptist Catholic Church, 4595 Bayview Drive, Fort Lauderdale, FL. In lieu of flowers, contributions may be made in Jim’s memory to the Pine Crest School Scholarship Fund, Attn: Susan Peirce, 1501 N.E. 62nd Street, Fort Lauderdale, FL, 33334."